Definition at line 26 of file CLLineEnding.h. Definition at line 22 of file CLLineEnding.cpp. Definition at line 36 of file CLLineEnding.cpp. References CKeyFactory::add(), CCopasiRootContainer::getKeyFactory(), mKey, and mpGroup. Definition at line 56 of file CLLineEnding.cpp. Definition at line 95 of file CLLineEnding.cpp. Referenced by addLineEndingToItem(), CLLayoutRenderer::map_arrow_head(), CCopasiXML::saveLineEnding(), CCopasiXMLParser::BoundingBoxElement::start(), and CLLayoutRenderer::update_textures_and_colors(). Definition at line 103 of file CLLineEnding.cpp. Definition at line 135 of file CLLineEnding.cpp. Referenced by addLineEndingToItem(), fillItemFromRenderCurve(), CLLayoutRenderer::map_arrow_head(), CCopasiXML::saveLineEnding(), CCopasiXMLParser::GroupElement::start(), and CLLayoutRenderer::update_textures_and_colors(). Definition at line 127 of file CLLineEnding.cpp. Definition at line 151 of file CLLineEnding.cpp. Referenced by CLRenderResolver::fill_base_maps(), CLRenderFlattener::flatten(), and CCopasiXML::saveLineEnding(). Returns whether rotational mapping is enabled or not. Definition at line 79 of file CLLineEnding.cpp. Referenced by applyRotationalMapping(), CLLayoutRenderer::map_arrow_head(), and CCopasiXML::saveLineEnding(). Returns the key string for the line ending. Definition at line 143 of file CLLineEnding.cpp. Definition at line 87 of file CLLineEnding.cpp. Sets whether rotational mapping is to be done or not. Definition at line 71 of file CLLineEnding.cpp. Definition at line 111 of file CLLineEnding.cpp. Definition at line 159 of file CLLineEnding.cpp. Definition at line 167 of file CLLineEnding.cpp. 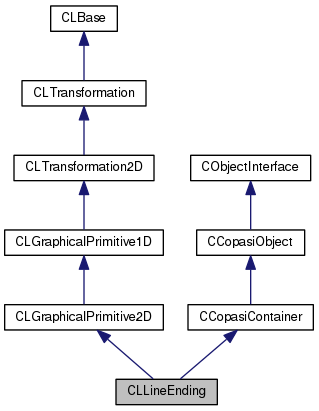 References CLGraphicalPrimitive2D::addSBMLAttributes(), CLBoundingBox::getDimensions(), CLDimensions::getHeight(), CLBoundingBox::getPosition(), CLDimensions::getWidth(), CLPoint::getX(), CLPoint::getY(), mBoundingBox, mEnableRotationalMapping, mId, mpGroup, and CLGroup::toSBML(). Definition at line 34 of file CLLineEnding.h. Referenced by getBoundingBox(), setBoundingBox(), and toSBML(). Definition at line 33 of file CLLineEnding.h. Referenced by getIsEnabledRotationalMapping(), setEnableRotationalMapping(), and toSBML(). The line ending needs an id in addition to the key. The id corresponds to the id in the SBML render extension and it does not have to be globally unique. As a matter of fact, it is sometimes needed that line ending of different render information have the same id. Definition at line 48 of file CLLineEnding.h. Referenced by getId(), setId(), and toSBML(). key string for the object. Definition at line 40 of file CLLineEnding.h. Referenced by CLLineEnding(), and getKey(). Definition at line 35 of file CLLineEnding.h. Referenced by CLLineEnding(), getGroup(), setGroup(), and toSBML().